Recently, Michelle Waycott, Chief Botanist of the State Herbarium of South Australia, signed an agreement with the not-for-profit organisation JSTOR on behalf of the Board of the Botanic Gardens & State Herbarium: The Journal of the Adelaide Botanic Gardens (JABG) will soon be available through the JSTOR shared digital library of scholarly content, to which the majority of Australian and overseas university and institutional libraries subscribe. This is in addition to free access through the Journal’s web-page, and strengthens the Journal’s presence in libraries worldwide. This week, a complete set of back issues was couriered to JSTORs scanning facility in India, where the journal issues are scanned, OCRed and the final PDFs created. Hardcopy journals will be stored in perpetuity in JSTORs secure storage facility in the United States. The Journal of the Adelaide Botanic Gardens is a peer-reviewed open-access journal, publishing papers in plant systematics, evolution, biogeography, taxonomy, nomenclature and related botanical fields, with a focus on Australia and the region. 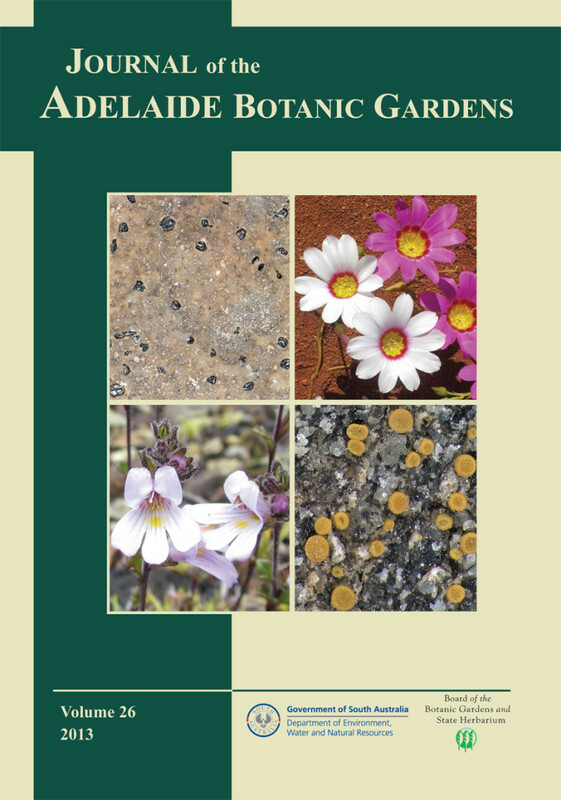 It is one of five botanical journals published by Australian herbaria and botanic gardens. Articles are published online and in hardcopy; all back issues are available on the Journal’s web-page. In addition, the State Herbarium of South Australia is also a partner of JSTOR Global Plants, contributing very high resolution images of herbarium type specimens as part of the Global Plants Initiative (GPI). This initiative aims to digitise and make available plant type specimens from around the world, together with other botanical resources, for research purposes. This entry was posted in News, Publications on 7 August, 2014 by Jürgen.